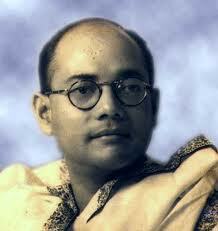 India," Subhas Chandra Bose wrote to his mother when he was only 15, "is God's beloved land." Thirty- three years later, towards the end of his life, he told fellow-Indians: "Never for a moment falter in your faith in India's destiny. There is no power on earth that can keep India enslaved. India shall be free and before long." Subhas' "discovery of India", unlike Jawaharlal Nehru's, occurred very early in life. Born in 1897, he was deeply influenced by the intellectual and cultural milieu of Bengal at the turn of the century. In school and college, he was a pure humanitarian, social reformer and, eventually, a political activist. By the time he graduated from Calcutta University, studied philosophy in Cambridge and qualified for the Indian Civil Service, his sense of mission was not in doubt. Subsequently he resigned from the ICS as he did not want to wear "the emblem of servitude". Subhas' acceptance of Chittaranjan Das as his political guru during the Non-Cooperation and Khilafat movements was a surrender to a man similarly dedicated to the cause of India's freedom based on Hindu-Muslim unity. His exile in Burmese prisons witnessed the transformation of a lieutenant to a leader. A leader, along with Jawaharlal Nehru, of the left-leaning younger generation of anti-colonial nationalists. Between numerous spells in prison, he played a major role in the student, youth and labour movements. India, he believed, should become "an independent federal republic". He warned Indian nationalists not to become "a queer mixture of political democrats and social conservatives". His demand at the Calcutta Congress of 1928 that "complete independence" instead of "dominion status" should be the goal of Indian nationalists was a sign that he was a step ahead of his contemporaries. He repeatedly spoke on behalf of the rights of three large communities -- women, depressed classes and labouring masses. When the Civil Disobedience Movement was launched, Subhas was in prison. He was elected mayor of Calcutta while in jail, in 1932. It was at the Karachi Congress and the second session of the Naujawan Bharat Sabha in the previous year that he spoke of the need for a new, Indian variant of socialism. Eventually in February 1933 he was released after being put on a ship setting sail for Europe. A greater part of his years of enforced exile was spent as an unofficial ambassador of India's freedom. This was the period which saw the transformation of a leader into a statesman. Despite being in poor health, Subhas travelled tirelessly, spreading India's message almost all across Europe and north Africa. Back home as president of the Indian National Congress Subhas provided an incisive analysis of the strengths and weaknesses of the worldwide structure of British imperialism and an egalitarian vision of the socio-economic reconstruction of free India. Towards the end of his first term as president his rift with the Gandhian right-wing of the Congress grew wider over the issues of his uncompromising opposition to the federal part of the 1935 Act, planning for socialism and insistence on inner-party democracy. In 1939, he defeated Gandhi's nominee Pattabhi Sitaramayya to be re-elected Congress president. Faced with a campaign of non-cooperation against him launched by the Mahatma, he resigned months later. Throughout this political crisis he received strong support, as ever, from his brother Sarat Chandra Bose and from Rabindranath Tagore. The poet who regarded Subhas as "Deshnayak" was confident that his apparent defeat would turn into a permanent victory. When on July 2, 1940 Subhas was arrested it was for the 11th time. He was sent home on December 5 after he had been on a fast-unto-death for 10 days. The government had worked out "a-cat-and-mouse policy" of taking him back to prison as soon as he had recovered his health. On the night of January 16-17, 1941, Subhas however made a planned escape. He was driven from his Elgin Road home in Calcutta by his nephew Sisir to Gomoh in Bihar from where he went on to Peshawar. He finally reached Germany. Subhas went to Europe primarily to gain access to Indian soldiers in the British Indian Army who were being held as prisoners of war. He had long believed that subversion of the loyalty of Indian soldiers to the Raj had to be a crucial part of the final phase of the anti-imperialist movement. German invasion of the Soviet Union upset his plans of an armed thrust from the north-west in support of India's unarmed freedom fighters at home. So he left and after a 90-day submarine journey arrived in South-east Asia. Netaji assumed leadership of the Indian National Army (INA) as its supreme commander. More than two million Indian civilians living in South-east Asia responded to his call for "total mobilisation". In his army of liberation Punjabi, Muslim, Sikh and Pathan professional soldiers fought side by side with Tamil and Malayalee rubber plantation workers. In his Azad Hind Movement Netaji was able to demonstrate by example how to achieve Hindu-Muslim unity and amity and also give women their rightful role in public affairs. He proclaimed the Provisional Government of Free India in Singapore and with "Chalo Delhi" on their lips the INA crossed the Indo-Burma frontier. The promised march to Delhi was halted at Imphal and Netaji was forced to retreat on foot with men and women to Malaya. "The roads to Delhi are many," he wrote, "and Delhi still remains our goal." In the winter of 1945 Netaji's soldiers were brought to the Red Fort of Delhi. The trial of some of their officers and the saga of the INA reached every Indian home. "The whole country has been roused," Gandhi observed, "and even the regular forces have been stirred into a new political consciousness and have begun to think in terms of Independence." Netaji had hailed the Mahatma as "the father of our nation"; Gandhi now returned the compliment by describing Subhas as "the prince among patriots". "Nobody can lose," Subhas believed, "through suffering and sacrifice. If he does lose anything of the earth, he will gain more in return by becoming the heir to a life immortal." Long after his mortal end, he remains deathless in the form of an alternative vision. Sugata Bose is professor of history and diplomacy and director, Center of South Asian and Indian Ocean Studies, Tufts University.